Your charge controller is perhaps one of the most complex components in your solar photovoltaic system, and as such it can be difficult to buy without the right information. This guide to buying a charge controller will provide you with the information you need when searching for a quality, durable piece of equipment for your renewable energy system. You’ll need to start your search for a charge controller after you’ve done a few things to determine what you need. 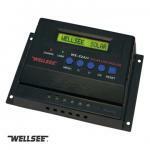 Most importantly, you’ll need to know your solar power which will depend on the amount of energy you wish to generate. Next, you’ll need to determine the proper amperage for your charge controller and whether your charge controller is compatible with your battery system – this can be ascertained by comparing a variety of factors such as voltage of your solar system. • Efficiency: Look for a charge controller with a minimum of 90% efficiency while operating at full load and rated output voltage. 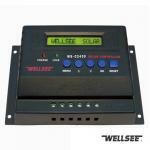 • Monitoring: The best charge controllers will come with built-in monitoring systems that make it easy for you to determine the performance of your solar system. These can include things like audio and visual indications, alpha numeric displays including LCD screens, and so on. These monitoring systems provide information such as output voltage (and alarms for when it’s low or high), battery levels (and alarms for low battery levels), kWh generated, indicators for battery reverse polarity, alarms for over loads, and equipment circuit breaker trips. 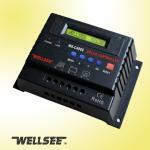 Having a manual reset switch on your monitoring component can be helpful for disabling alarms and resetting the system. • Battery Discharge: When not properly configured, batteries can discharge through the solar modules during non-sunlight hours, which will decrease your system’s efficiency. Look for a reverse flow protection system to prevent these problems. • Psophometric Noise: Some charge controllers produce an excess of psophometeric noise which can disrupt the signals for televisions, radios, telephones, and other electronic equipment within close proximity. Look for a charge controller that limits this noise level to 2 mV. • Overload Circuit: Overloading and short circuiting of your system can occur. To prevent and protect against this, look for a charge controller with a load/short circuit protection system to prevent fires and other hazards. • Reverse Polarity: If you want to protect the other components in your electrical system, look for a charge controller that has safeguards in place to protect against the potential damage caused by a reversed polarity. • Burn In Test: This test helps determine that the charge controller is running as anticipated and therefore is a handy function to have. The burn-in test should run for 72 hours with the equipment working at full rated load. Of course, it’s one thing to look for these ratings, but you should also verify that any claims about the charge controller are true. Do this by asking for a test certificate that shows any given charge controller to meet all of your requirements. • Dimensions: The charge controller should be large enough (including battery and lightning protection system) to house all of the components without hindering functionality, but not so large as to require significant space. • Distance Considerations: Some charge controllers require close proximity between the batteries and the solar panels, which can create problems with installation. The charge controller with flexibility in distance requirements will make your life a whole lot easier. • Expandability: If you’re planning on expanding your solar system in the future to accommodate additional modules, ensure that your charge controller will be able to handle such system design changes. • Quality: Your solar modules will be with you for 20 years or more, and though your charge controller isn’t likely to last quite that long, it’s important to choose one made with quality materials. Look for ones that come in metallic boxes with captive screws and washers. A hinged, easy to operate door will also aid in making it easier for you to access your charge controller and batteries. And look for components that are surfaced with corrosion resistant finishes to prevent corrosion. • Ventilation: Your charge controller should have proper ventilation while protecting the charge controller from inclement weather, including rain, snow, hail, and so on. Ideally the hardware will be designed to cool the components through natural ventilation. • Standards: It’s important that your charge controller meet minimum safety standards to protect you and your system. Look for UL and cUL rated charge controllers whenever possible. It’s also recommended that you look for charge controllers that come with wiring and cabling rated to be fire retardant as per IS 1554 with amendment 1 (June 94). A further test of quality and workmanship would be to look for the charge controller to be made to ISO 9001-2000 (or later) standards). • Instructions and Diagrams: Be sure that your charge controller comes with basic circuit and cabling diagrams, safety measures to be observed in handling the equipment, precautions for installation, detailed drawings of the charge connector modules, procedures for routine maintenance, preventive maintenance, troubleshooting, and replacement, and illustrations of internal and external mechanical parts, all in your language to make the job of putting the system in place as hassle-free as possible. • Name Plate: Be sure that your charge controller includes a name plate with all of the specifications for your future reference, including name of the user, manufacturer’s name and identification, model number, type of unit, serial number, input voltage, output voltage and current, and so on. With this guide to buying a charge controller, the difficult task will seem much less daunting. Next： What are Good Effects from Using Solar Power?